At Jetset Plumbing we pride ourselves in the ability to find, locate and fix all kinds of leaking showers quickly and affordably, call us today on 1800 443 996. A leaking shower rose may indicate the taps are not turning off fully and require a tap service. The house next door may have a leaking shower floor waste which is leaking onto their ceiling below. The house next door may have a hole in their water proofing membrane. All of these people have “leaking showers” however each of them require a specialized tradesman to fix each of them “detectors” are not licensed plumbers and cannot fix the problem once they find it. Upon finding what the source of the problem Jetset Plumbing can provide the best solution for the repair. Our leak detectors are also fully licensed and experienced plumbers and will make short work of your leaking shower. What types of leaking showers are there? Shower rose leaking. The cause is usually that the taps are not turning off fully allowing water to pass through and out the shower rose. A tap service is all that is usually needed. Cracked tiles are a simple way for water to travel through to the waterproofing membrane. Tap penetrations, if these are not siliconed shut they may allow water to travel through into the wall. Shower leaking through tile grout. Over time tile grout decays through harsh scrubbing and acidic chemicals leading to shower leaks. Old silicone, may allow water to travel through, around and under. A leaking shower floor waste is usually picked up by water dripping into the below floors ceiling you may also see stains or mould on the ceiling below. Shower leaking through ceiling, often caused by a leaking shower floor waste. Shower leaking behind tiles, the reason can range greatly and are usually caused by one of the other problems outlined here. Water pipes in the wall, ceiling and floor. Leaking shower membrane, can allow water to travel to the room below, into the slab or across the floors into adjoining rooms or hallways. 3 reasons why a leaking shower is such a serious problem? Leaking showers can attract termites, as they are perfect conditions for living (a rich food source of timber and water). Mould build up is a major health hazard. 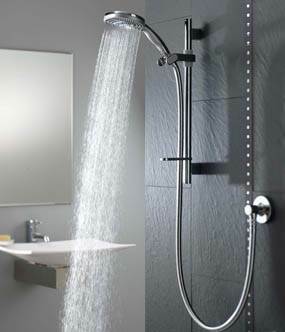 Leaking showers are a common cause of excess water usage and bills. Simply call Jetset Plumbing on 1800 443 996 and we will dispatch a fully qualified, licensed and insured plumber to fix your leaking shower.